As I am writing this I'm attempting to upload my first YouTube video to my channel. The whole process has taken waaaay longer than I anticipated though! Hopefully with a bit of practice and organisation I'll get more speedy. 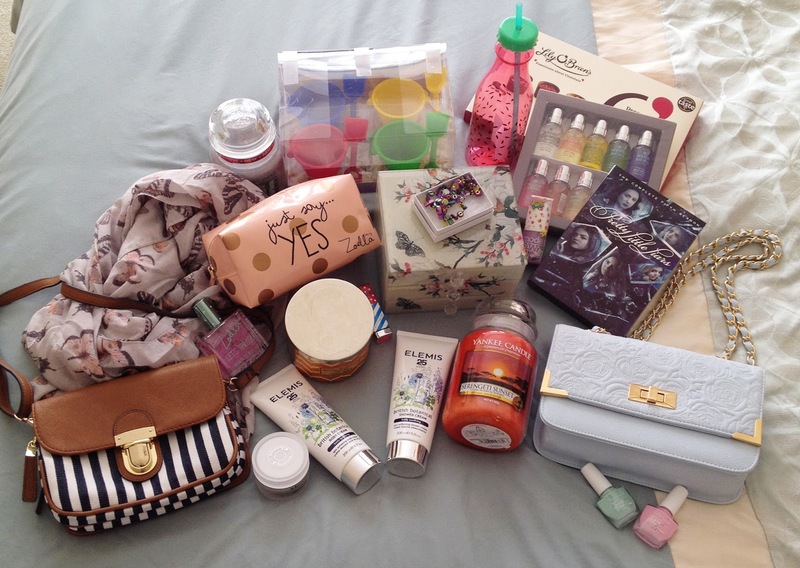 When it is eventually uploaded though it will be a Birthday Present Haul Video featuring many of the gifts I'm sharing with you today. I took so many beautiful photos of them though that I wanted to do a separate blog post as well. You can check out my post about my Birthday Outfit, here. I was given this lovely Nautical Cross the Body Bag which I'd had my eye on for a while. 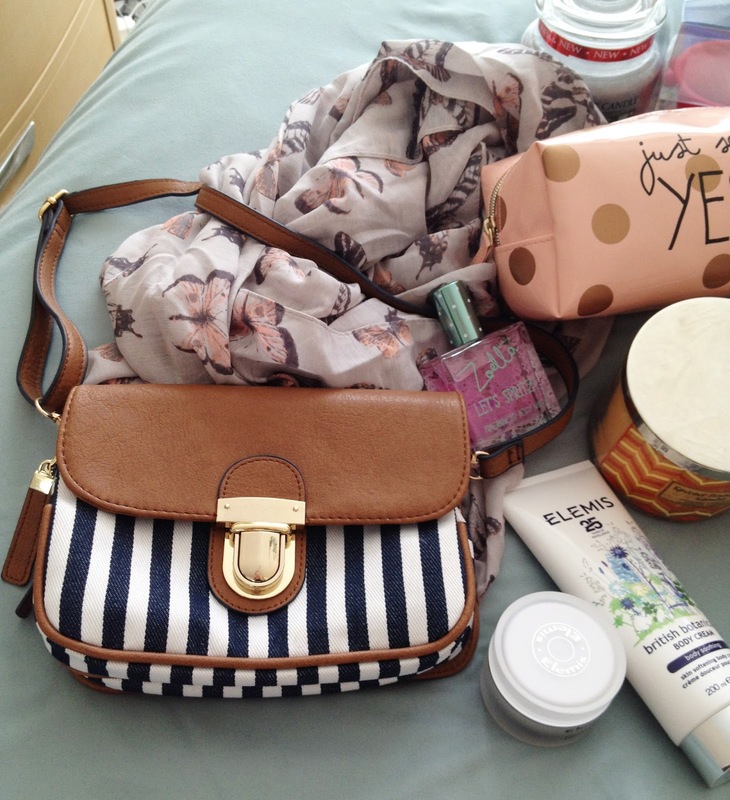 I love the tan colour and nautical stripes and it is an ideal size bag for me to carry. I got this Butterfly Print Scarf, I'm a bit of a scarf addict and this one in dove grey with peach butterflies makes a nice addiction to my collection! For those of you who saw my previous blog post you'll know I design & make jewellery so I'm always in need of more storage for it all! It can be difficult to find pretty jewellery boxes but this one by Marks & Spencer is so beautiful in mint green, glass top, with a delicate floral & butterfly pattern. It looks so pretty on my dressing table and has now tidied away all my latest pieces! 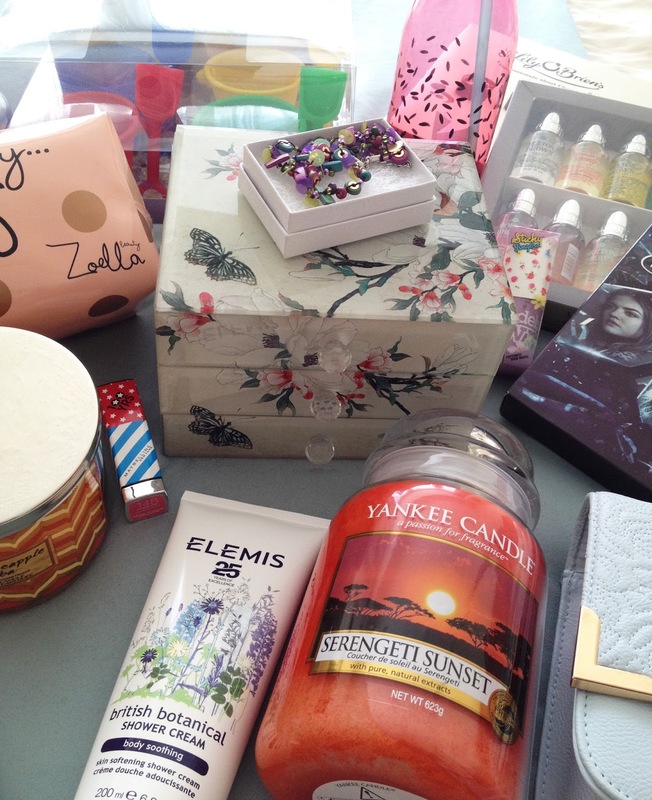 Yankee Candles are my absolute favourite brand of candles (I have a scary amount hoarded!) 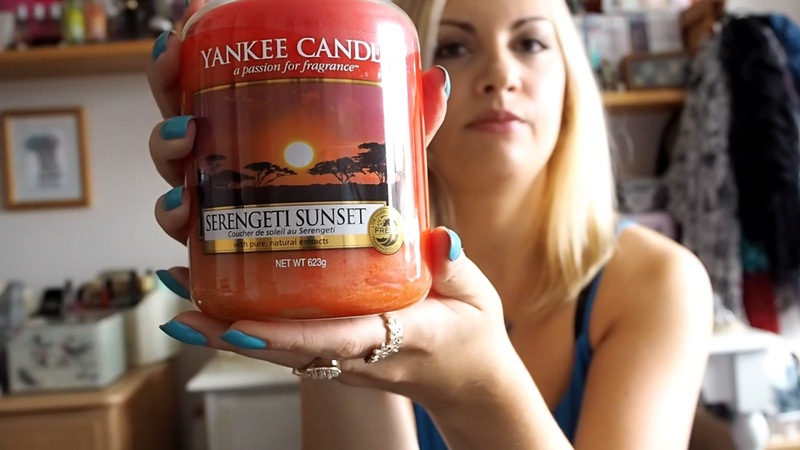 and this Serengeti Sunset one is from their new Out of Africa Collection. I fell in love with the colour and image on the front as well as the fruity fragrance which is decribed as an "enticing blend of fruit, citrus, lotus flower and amber (that) celebrates the haunting beauty of the African sky". A few makeup bits I got included this Maybelline Lipstick in Sweet Pink (148) a really pretty girlie shade and it smells sweet too! I got a couple of Nail Polishes also Maybelline in pretty pastel shades, Mint for Life & Pink in the Park. 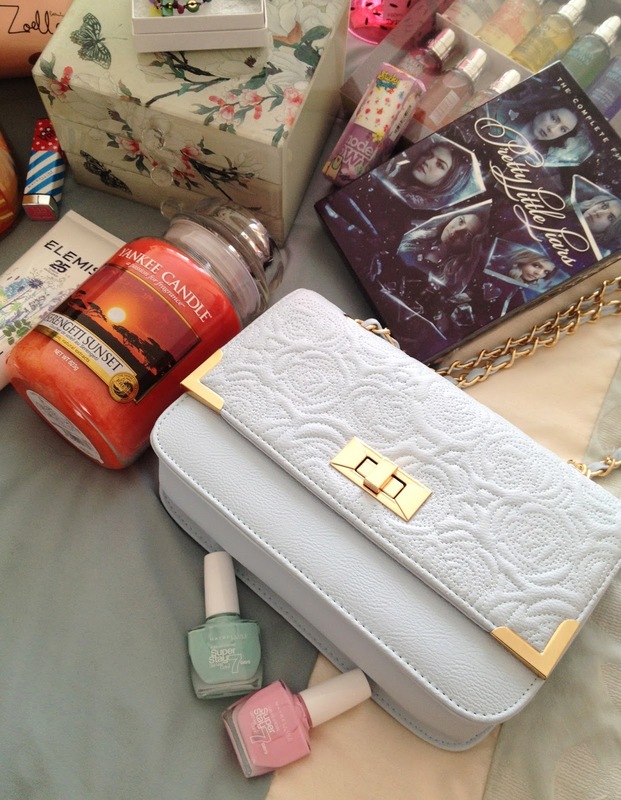 A friend of mine gave me this cute Pastel Blue Bag, I love it! The stitched rose detailing on the flap is adorable plus this shade goes with many of my outfits at the moment. As a keen baker I enjoy trying out new cake/sweet treat recipes and how cool are these silcone Bucket & Spade Moulds from Lakeland?! They make your bakes pop out like little sand castles, I'm so excited to try them out! I'm addicted to the TV series Pretty Little Liars and although it is on Netfliix there is something about having a DVD boxset that I still love! So now I can binge watch the whole of Season 5 along with the special features. I got a Molten Brown body wash gift set which houses ten different mini's for me to try out. I love a bit of nail art, those who follow me in instagram will see I regularly post pictures of my nails. I'm looking forwrd to playing with this lilac Models Own Nail Polish which comes with cute little flower stickers to add to your manicures! I got some unique gifts from my sister, Emily, who hs spent the past 8 months travelling around Australia. These came from Melbourne, a watermelon printed juice bottle and a little braceet with a map embossed into the heart which matches the one that she has! 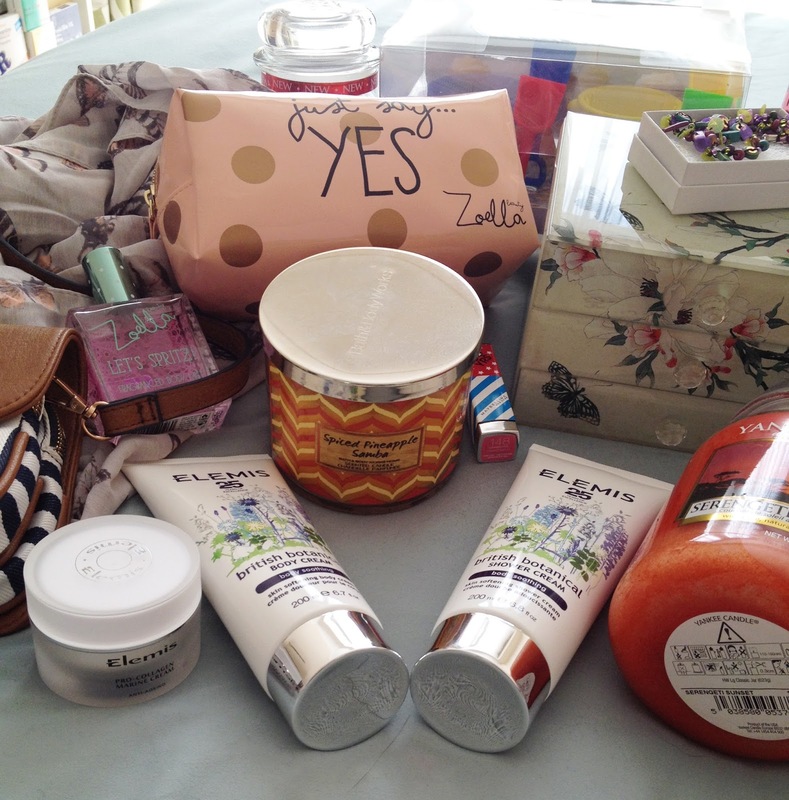 A friend got be this peach Zoella Beauty Makeup Bag which contained all sorts of goodies including the Zoella 'Let's Spritz' Perfume. Aren't they pretty?! She also bought me my first ever Bath & Body Works Candle in Spiced Pineapple Samba. It smells so yummy and fruity I can't wait to start burning this! I've heard Bath & Body Works Candles have a really good throw on them. I also got a collection of Elemis Products which including some of my can't-live-without' skincare products! I have used their Pro Collagen Marine Cream as my everyday moisturiser for about the last 18 months. I love the light texture and the way it leaves my skin feeling! The Pro Radiance Cream cleanser is usually my evening cleanser as it just melts away my makeup, even waterproof eye makeup, thumbs-up! These two tubes in the photo are new British Botanical body products a shower cream & body lotion which both have a very relaxing herbal fragrance to them. I'd had my eye on this beautiful, red printed Floral Blazer from Oasis since I bought the matching shorts earlier this summer. It's light weight with a relaxed, slightly oversized fit. I'm thinking of adding it to a simple outfit, a pair of jeans and a white cami or shirt. 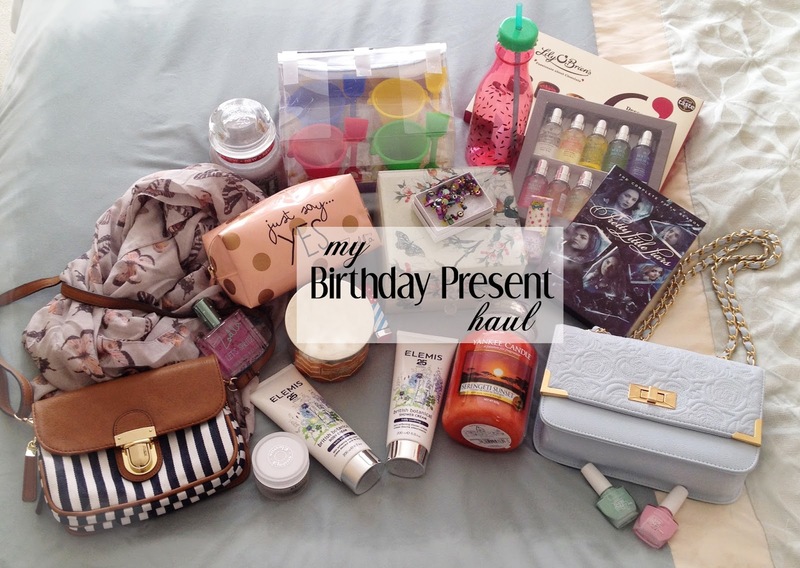 I hope you enjoyed looking through some of my birthday presents with me. I've finally been able to add my blog to Bloglovin so please Follow Me! Wow! 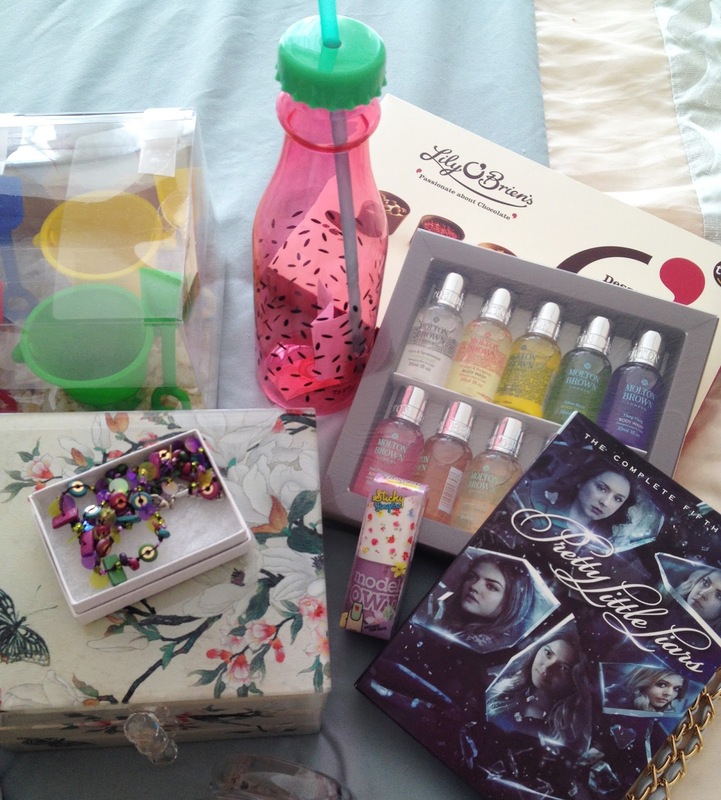 You have got some lovely birthday presents! I love your nail paint. Which brand is it?